<i>U.S. News &amp; World Report’s</i> 2012 edition of America’s Best Graduate Schools ranks RIT 21st among the nation’s universities offering graduate-level studies in fine arts. 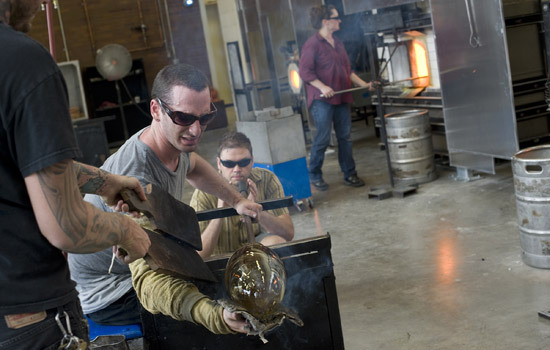 RIT’s glass program in the School for American Crafts tied for second in the country. Rochester Institute of Technology is among the top colleges and universities in the nation for master’s programs in fine arts, business and engineering, according to U.S. News & World Report’s 2012 edition of America’s Best Graduate Schools. RIT ranked 21st among universities offering graduate-level studies in fine arts, with the College of Imaging Arts and Sciences’ programs in glass and photography earning high prominence. The rankings are based solely on the results of a peer assessment survey, featuring input from art school deans and other top art school academics at 220 master of fine arts programs in art and design from across the country. The master’s in business programs, offered through the E. Philip Saunders College of Business, ranked 63rd in the nation. The rankings are based on surveys of business school deans and directors of accredited MBA programs, corporate recruiters and company contacts hiring MBA graduates. Placement success of graduates and student selectivity were also among the factors weighed. RIT’s graduate programs in engineering, from the Kate Gleason College of Engineering, ranked 85th in the country. Programs at engineering schools that grant doctoral degrees were surveyed. Engineering school deans and deans of graduate studies rated the programs’ overall quality. Corporate recruiters and company contacts hiring engineers with graduate degrees also participated. Other indicators included student selectivity, faculty resources and research activity. America’s Best Graduate School is online at www.usnews.com/grad, and highlights of the rankings will be published in the April 5 edition of U.S. News & World Report. At the undergraduate level, U.S. News & World Report ranked RIT seventh in the “Best Universities—Master’s (North region)” category. The magazine released these rankings in August. RIT also received the second highest peer assessment score, which is a survey of presidents, provosts and deans from other universities judging a school’s academic excellence.